Wow what a fabulous second season! Thank you to all our guests who came to stay this year and made 2018 such a wonderful second season. We were so delighted to welcome back so many guests returning this year, such a compliment that so many returned for their second time to Lower Keats. We also made lots of new friends, that visited for the first time this year, who we hope will return again and again, now that they have also found us! We were super organised and ready to open for 2018 just before the Beast from the East visited on 16th March, unfortunately this caused havoc with our waterworks and we had to replace most of the showers that had just been refitted after their warm winter in the barn. We won’t be so early to get set up next year! Hope you enjoyed our live video snow check on the tents as much as Willow and Buster did! Fortunately the tents themselves survived The Beast without any damage, we remind ourselves regularly that this is why we are only open from Easter to October half term. Even though we had amazing icicles on the verandas – it was certainly too chilly for Glamping. The boys had fun creating avalanches whilst knocking the snow off the tent roofs and we have the bonus of plenty of shower spares now! Normal service was resumed ‘just’ in time for the first guests at Easter. We welcomed Spring lambs and guests had super fun bottle feeding them from Easter; then at the end of the season hand feeding them pellets; along with massaging the new piglets (we had two girls this year) who only escaped once. Gary hatched out his first hens eggs, (he was so delighted) so guests in June were able to handle the tiny chicks – exciting times. The ducks continued to have fun, ducking and diving in their pond and always put on a great show for anyone collecting eggs at feeding time. We welcomed new-born calves for the first time this season, fabulous fun was had by so many bottle-feeding and brushing them. We were thrilled that so many guests chose to return to Lower Keats this year, hope to see you and many more again in 2019! Press/Reviews – Wow what a busy year! Four in A Bed: In May we took part in Channel 4’s Four In A bed; we thoroughly enjoyed our time filming the show, which was aired at the end of September. Who would have thought we would be on TV when we started our Glamping journey! We were approached to take part and Gary wisely thought we should. (17K hits on our website proved he was correct). We had fabulous scores and were delighted with our reviews and feedback from the other competitors, 2 out of 3 guests thought we were great value for money and paid in full, sadly one couple decided it was not their cup of tea, although they said ‘if anyone liked Glamping that we would be the crème de la crème of glamping’. Hence their low payment and we sadly we didn’t win. We won’t give away anymore spoilers as you can still watch it on All4 – enjoy! Watch it here! Nadia Sawalha and Family: Nadia stayed with us in September and made 13 Glamping VLOGs of her time with us and her travels around Devon. Watch her fabulous lodge review video and animal feeding here at the farm. Looking forward to welcoming Nadia, Mark, Nanny Di and the girls back again very soon. Muddy Stilettos: We were listed in the Muddy Stilettos Little Black Book this year and Muddy and her family stayed with us later this summer. Read her fabulous review here. Thanks to all our guests lovely reviews and positive feedback; both online and in our lodge guest books. Our lodge review books are filled with such kinds words about us and our guests adventures, read our Testimonials page. If you have yet to leave us an online review after your stay (TripAdvisor/Facebook/Google etc) – please don’t delay, your information really helps guests decide to stay with us. 😉 All online reviewers are put into our annual draw for £150 voucher off a stay or spend in our honesty shop. We landscaped our welcome area by the Honesty Shop, adding posts, rope and stones. Dug in more land drainage in the glamping field to ensure the field stays drier in wetter weather. Added yet more lovely squishy cushions and blankets to the lodges, realised we hadn’t supplied garlic presses, so popped those into each lodge too. Added to our animals by bottle feeding new-born calves before they then cavorted around the adjacent fields for the rest of the summer. As our last guests departed after October half term, you might be forgiven for thinking we would be having a rest, but in many ways we are just as busy in the winter months as in the summer, stripping down the lodges, then repairing and preparing for the next season. This winter we have exciting plans to build a locally sourced communal shelter, for groups to gather together and chill when the weather is not so kind, and for our 2019 Wellbeing breaks to enjoy during yoga meditation on retreats. A beautiful locally made swing chair has already arrived for our Honesty Shop area – see our Blog. New bbq/firepits for each lodge are on their way, additional fixed solar lights will be added to the living/kitchen areas to brighten up mealtimes and evenings. Finally a dog kennel facility so guests can leave dogs safely on site, if they wish to visit local places not so dog friendly. The ducks are looking forward to their new duck pond (Gary is going to be busy with his digger) as well as cutting hedges around the farm with his new hedge cutter! The glamping meadow is ready for the sheep to graze for the winter months, ensuring lovely green grass next season – we have protected the tent straps with drainage pipes and fencing to stop them enjoying their glamping experience too much. In no time at all we will planting up pots, restocking the shop and setting up the lodges ready to welcome our first guests of the 2019 season. We open for our 3rd season on the 22nd March, unzipping our canvases for 2019. Book soon if you would like to stay and make unforgettable memories with us. Easter: We have a few Spring spaces including Easter weekend, May Bank holidays and May half term. Whatever the season and weather during your stay, we guarantee you a luxury break at Lower Keats. Spring in Devon is often warm and dry but even with wet and windy weather our guests love the cosy feel of the lodges and firing up the wood burner to enjoy quality time snuggled up together. Summer months allow guests to take advantage of their lodge fire pit and BBQ whilst watching the clearer starry skies above. Our meadow is perfect for team sports, cricket, rounders & football for those wanting a more energetic break during the longer hours of sunlight. Autumn breaks can be the most relaxing, the beaches, restaurants and lanes are quieter, parking and tables at the best places are much easier to book. Book a relaxing break, enjoy the slower pace of life of a Devon Autumnal break. Wellbeing Retreat: Don’t forget to register your interest at info@lowerkeatsglamping.co.uk if you are interested in our first Wellbeing Retreat and we will be in touch very soon with further exciting details. We have had no increase in prices for 2019, and are continuing with our offers of: £100 discount for couples during mid-week stays, and introducing our ‘dogs stay for free’ mid-week offer too, don’t delay to book your preferred break next year. Follow our facebook page and bookmark our Special Offers page to ensure you don’t miss out on any giveaways, late availability or special discounts during the year. 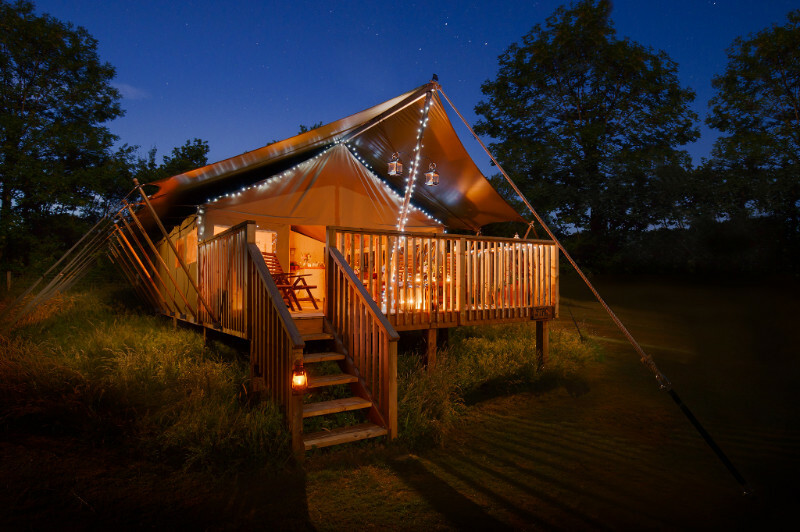 Book by emailing info@lowerkeatsglamping.co.uk, calling 07540 367386 or going to the Bookings page of our website. Hope to welcome you in 2019! Linda, Gary & the boys.